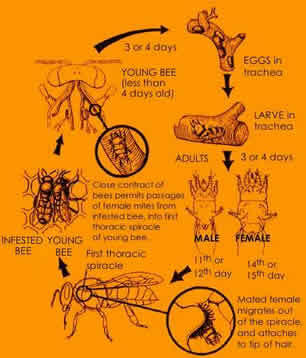 The parasitic mite Acarapis woodi causes Acarine disease in honeybees by infesting the breathing tubes (tracheae) of the adult bee, piercing the trachea wall and feeding on the bee haemolymph. Apiguard helps to control trachael mites and Acarine. VitaFeed Gold helps boost honeybee immune systems. Tracheal mites are invisible to the naked eye – they measure only 125 and 174 microns – and can therefore be seen only with a microscope. They are oval in shape and translucent-white in colour. Adult bees can be seen crawling on the ground or on grass in front of hives of heavily infested colonies. But this evidence may suggest more than a tracheal mite infestation – it may indicate the presence of other diseases. To check for infection: adult bees are decapitated and the prothoracic collar removed with a scalpel. The thoracic tracheae can then be inspected. When stained, infested honeybee tracheae will show up as brown or black scabs or may be entirely black depending on the infestation level. Non-infested healthy tracheae appear transparent and clear-amber (Delfinado-Baker 1984). Female tracheal mites enter the first thoracic spiracle of the young honeybee and lay 5-7 eggs. Eggs hatch in 3-4 days. The six-legged larva develops through a nymphal stage to the adult male in 11-12 days or to an adult female mite in 14-15 days (Morgenthaler, 1931). They mate within the trachea where the mites then develop. Pregnant females then leave the bee via the spiracle and attach themselves at the tips of the bee’s body hairs. When another bee comes into contact, they transfer to the new host and infest again through the spiracles. Selective bee breeding is the first measure that beekeepers should employ to counteract tracheal mites. Buckfast bees, for example, are known to be highly resistant to this mite, while New Zealand strains are very susceptible. 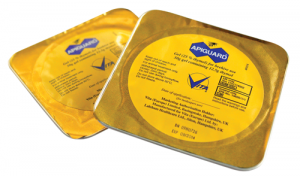 Apiguard has been shown to work well in several countries in controlling tracheal mite numbers. Menthol crystals have been used with considerable success in North America although relatively high temperatures are required and the effects are variable.